Now offering Train-the-Trainer Certification. Details below. "Over the last year 350 people in 9 countries have become way more productive than we ever imagined they could be. Our agile processes are successful primarily because everyone takes ownership by understanding and practicing The Responsibility Process™. Today we produce twice the software with half the headcount." "This can change your life." Contact us for a private session or to explore co-hosting. You may substitute anytime. Cancel more than 4-weeks prior for a full refund. You may switch session dates any time. No refunds after switching a session date. Work directly with The Responsibility Process and The Keys to Responsibility to practice leadership and coaching tools that Christopher and his students in The Leadership Gift Program apply with their teams and clients. Train-the-Trainer - Attend this workshop as a participant. Then immediately attend the Train the Trainer workshop on the following day with Christopher Avery. See the “combo” registration ticket for this two-day option. "Extremely engaging, entertaining and educational workshop! The Responsibility Process is a simple and powerful model for understanding our reaction to anxiety/conflict. 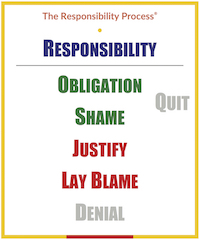 Understanding the model will help direct you to operate from a position of responsibility sooner when conflict arises." "This experience is for anyone who wants to own their destiny and get to the next level. I was even able to use The Responsibility Process model on my drive home from the workshop. I can't tell you how eye-opening and free it felt to realize that I really do have the power within myself to make changes that are really totally up to me!! Thank you, Christopher!" "This seminar is eye-opening and absolutely essential for developing executive presence, emotional intelligence, and presence of mind." —Mark Harris, QA Director, Grange Insurance, Columbus, OH. "This workshop will help you understand why you and people around you respond to problems the way they do. It will make it easier for you to challenge your own reactions and grow on a personal level. It will also make it easier for you to accept the way people around you respond. This model helps you to talk about your reactions and gives you an easy frame of reference that you can use to improve yourself and attain a higher level of personal freedom. It has become a key element of my path towards personal freedom and growth." "The workshop is a great opportunity to make you step back for a while and think about the internal processes inside your head on how you react to problems. It makes you reframe your natural responses in respect to taking responsibility and take control over this aspect of your life. It puts you in the driver seat again. Christopher Avery has a vast background in the matter and can introduce you step by step. If you want to understand yourself, follow this workshop to get insight in this element of your behavior." "Christopher Avery's Leading and Coaching workshop is one of the most valuable training events I have attended in my professional career." "A not-to-miss workshop for you and your colleagues. This course was really great. Christopher is inspiring on a topic that is crazy important. It does not matter what your background or role is. Even if you already know about The Responsibility Process, this course goes into more detail on why you are on certain "islands", thereby granting you more insight into improving yourself. You will also benefit from the experience and input from other attendees." "This is powerful stuff! Christopher's class is crucial for sharing the insights to unlock your own ability to be responsive to critical situations and to help model behaviors for your teams to be able to do the same." "I learned the underlying essentials for success with Agile, and more importantly, for a significant and satisfying human existence - be it in life or in Solution Delivery. This workshop was a transformative enlightening of human nature and specifically what we need to first acknowledge and overcome in ourselves in order to affect a significant and satisfying existence. " "Very efficient. I gained a lot of knowledge in a short amount of time. I’m already using the concepts in my day-to-day leadership style." "The Responsibility Process in general and this session, in particular, is one of the most valuable educational experiences of my career." "If you want to gain insights about how and why you (and everybody else) are reacting when things go wrong at the job, in your life, in your family, etc.. And gain insights how those reactions are impacting on us and others." "Once you see how much time and effort you and your team members can waste on the islands of "lay blame", "justify", "shame", and "obligation", you will want to learn this stuff ;-) "
"Before the workshop, I was not aware of the big difference between responsibility and accountability - and what difference it makes when people in your team take responsibility." "Great experience, very inspiring. A very good starting point for thinking about own and other's behaviors for changing to high performance." "A great opportunity to learn more about how people approach problems when they occur. By understanding the process you can help coach others to understand and improve the way they approach problems." "This a life changer not just another leadership training (and I've done many). Christopher's deep knowledge of this research and the simplicity of the process makes it very compelling and practical. I used the learning next morning with my family and my wife now wants to attend this workshop!" "Christopher delivers outstanding, relevant, thought-provoking and timely information that will get you thinking differently about how to improve upon all aspects of your life!" "It is an action-packed insightful, motivating workshop that emphasizes the importance of taking ownership for our own coping versus growing strategies." 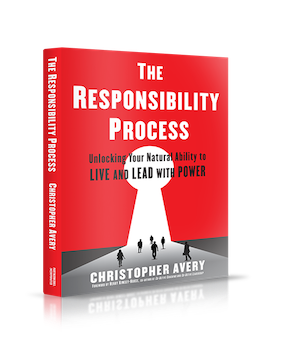 "Christopher Avery does a great job at prescribing success at life through mastering your own psychology of The Responsibility Process." "I've already been blabbing on about it to my husband; I think it drastically changed his mindset about himself and his employees." "You should really go to this, it can change your whole outlook on things." "This was an excellent and informative training. Rather than focus on a specific technique to train it simply provides insight into a thought process that everyone goes through. Being aware of that process can allow you to move toward responsibility and ownership much faster." "This was an awesome class. I was able to identify different points in my life where I participated below the line. The class made me better understand what it means to be responsible and how we use "excuses" for anything less than responsibility." Contact us about bringing this workshop to your town or organization.